NSL Photography Blog: Lexar is back...or at least soon will be. That's great news for Nikon. In September, the Lexar brand was acquired by Chinese flash storage manufacturer, Longsys. At the time, Longsys' plans for the Lexar brand were not announced publicly. At the PDN PhotoPlus Expo at Javitt's Center in New York City in October, in the Lexar booth, employees discussed the future of the Lexar brand with photographers attending the event. Micron will be selling its flash memory to Longsys who will assemble it into memory cards. From there, in order to use the existing Lexar distribution network, Longsys will ship the memory cards back to the U.S. Lexar facility for sales under the new Longsys/Lexar label. Apparently, Longsys had been assembling the memory cards all along for Micron/Lexar from Micron flash memory. Micron decided to drop their Lexar retail business because it didn't meet their profitability margins. According to Lexar, at the PhotoPlus Expo, Longsys will continue making XQD cards under the Lexar brand and it appears that they will be in stores soon. It was also explained that there is a warehouse full of Lexar CF, SD and XQD cards in Tennessee, but with the old Micron/Lexar labels. A licensing arrangement is being negotiated, so hopefully these items can be sold by the new Longsys/Lexar company while manufacturing of new memory cards revs up. 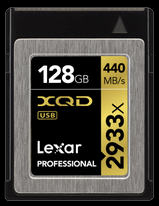 Over the long haul, Longsys/Lexar will make memory cards including XQD cards. They will make the next generation of XQD cards, CFExpress cards, in the future. We don't know what product mix Longsys/Lexar will choose to manufacture, but it will likely be similar to the Micron/Lexar mix for now, and will change over time based on demand. At the PhotoPlus Expo, Longsys/Lexar confirmed XQD backward compatibility that we already knew CFExpress theoretically had, as CFExpress is actually the next generation of XQD under a different name. Longsys/Lexar agreed the CFExpress card should be fully backwardly compatible with existing XQD devices and that a firmware update for the Nikon D4, D5, D500 and D850 should be all that's needed to have them work with CFExpress cards. That aligns with Nikon's commitment to create firmware updates once CFExpress cards are available, to make Nikon existing XQD slot equipped DSLRs able to use CFExpress memory cards. In reality, as discussed in my article last week, Nikon XQD based cameras have a future, the CFast memory card is dead end technology, I expect that Canon will change to CFExpress for future models of their high end video and camera units. Moreover there should be many memory card manufacturers in addition to Sony and Lexar producing the CFExpress cards. We already know Hoodman and Delkin will be producing the cards. I expect that Sandisk will make the cards too. The transition for Nikon's existing XQD equipped DSLRs should be smooth. Experts indicate that it should be a trivial matter to update even first generation XQD slots to accept a 3rd generation cards, though a first generation XQD based camera will not be able to run at 3rd generation speeds. Older DSLRs with first and second generation XQD slots, such as the Nikon D5 and the Nikon D500 will have a long term source of memory cards, but these older cameras' read/write speeds will be limited by their existing processor, cache, and PCIe bus interface. While some may hope that Nikon will make a CFExpress slot pair insert for the D5, I don't think that will happen. I assume that the Nikon D6, whenever it is introduced, will have a 3rd generation CFExpress slot pair. Even with a native CFExpress slot pair, the Nikon D5 read/write memory card speed would be limited by its current processor and cache. On the other hand, a Nikon D5 with compact flash (CF) slots would significantly benefit by having Nikon swap out the memory module for an XQD module, at the previously quoted cost of $350. That would produce a major performance upgrade for a Nikon D5 with CF slots. Many had serious questions about the long term viability of Nikon's professional level DSLR line equipped with XQD memory card slots. Those questions have been answered. Nikon's bet on the PCIe bus based XQD technology was a good one. In the future, it's likely all high end cameras, until the next technological advance in memory cards comes along, will use the CFExpress technology.